I was on my way to Washington DC via the Midway airport at 5:30 a.m., and there was a concert going on across from my boarding gate. Three singers wearing Army side caps were singing old-timey songs in front of a full house audience in the waiting area. A whole bunch of people in orange shirts pushing wheelchairs were gathering at the concert, and I asked a lady wearing a green shirt what it was all about. She said that 92 World War II veterans were going to Washington DC. 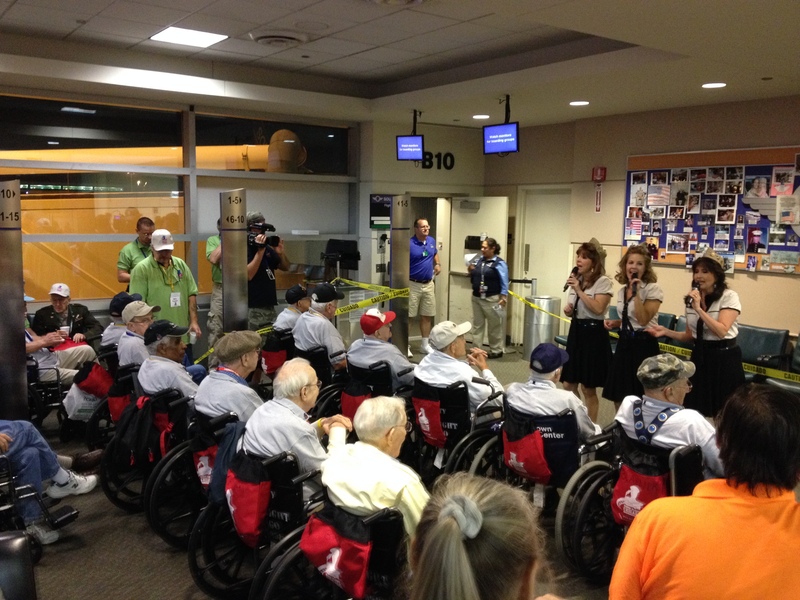 The trip was sponsored by Honor Flight Chicago, a privately funded organization. The average age of the veterans was over 80, and one was 101. The people wearing green were family members going with the veterans to DC; red shirts were medical; orange shirts were local volunteers. One veteran got up and danced along with the songs. What a different experience at the airport boarding gates, and what a warm-hearted America I live in. You are currently reading Boarding Gate Concert at Woven-Words.